This is Andy. He's been at the sanctuary for a few months now. You may not know this but rabbits have it tough: They are the 3rd most popular companion animal and the 3rd most euthanized; they are used extensively in research/vivisection, slaughtered for their fur and killed for their meat. 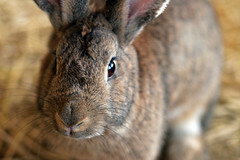 Andy was one of three rabbits confiscated by animal control, saved from the butcher's block. They were without food, water and shelter. Around 800,000-1,000,000 rabbits are slaughtered every year for food. Get this: They are classified as poultry because they are killed in the same facilities as birds. You may not know this but the Federal Methods of Humane Slaughter Act does NOT require birds to be stunned insensible to pain before their throats are cut. That's 9.2 billion birds who (if in federally inspected facilities) can be killed fully conscious. And since rabbits are killed in the same facilities, they too do not need to be rendered unconscious. They are either bludgeoned to death or killed via cervical dislocation. That is a nose that needs to be kissed. Also, your post rules. I wish I could repost it in stupid communities that think bunnies are so cuuuuuuuuuute but then eat rabbits and wear their fur along with make-up that's tested on them? Yeah. Clarification: Oh wait, no, you rule. But I agree, they are cute! I'm a French Lop guy myself. I think Andy prefers a more hands-off approach. Sometimes he does nose bop me but only for food (and camera shots). ...I like rabbit. I had no idea it was classed as poultry. I had no idea that poultry were not required to be stunned in any form. Are there any humane avian slaughter houses? You're asking the wrong person! :) (Mainly b/c I'm not sure there is such a thing as "humane slaughter"). State laws vary with regards to slaughter laws. In California, for example, broiler chickens must be stunned insensible to pain in CDFA inspected facilities but egg-laying hens, quail and other game birds don't. You could check your state laws to find out if there is a state slaughter law (which would apply only to state-inspected facilities). If you buy local and from small farms, you can always ask what processing facilities they use or how they slaughter the animals. I've found that smaller farms are more transparent with their practices and generally transport their animals to much smaller slaughterhouses. Some places even use a mobile slaughtering truck, which eliminates the stress of transport. It isn't that common, though. oh yes, i DO know these things about rabbits. i'm glad you educate people about this stuff. i adore the AAVS. I love me some bunnies!!! I had two of them awhile back, and I loved them so. They're so fuzzy and cuddly.